I have always been fascinated by chameleons and over the past two years, I've learned there is more to keeping them than throwing a few crickets into an enclosure. After seeing multiple chameleons with health concerns, and, possibly, even bringing on a few of them myself from lack of knowledge, I wanted to gain a further understanding why things happen. In the time I've spent caring for these marvelous lizards, I've become very attached to helping sick chameleons, and teaching others what I have learned from experience. 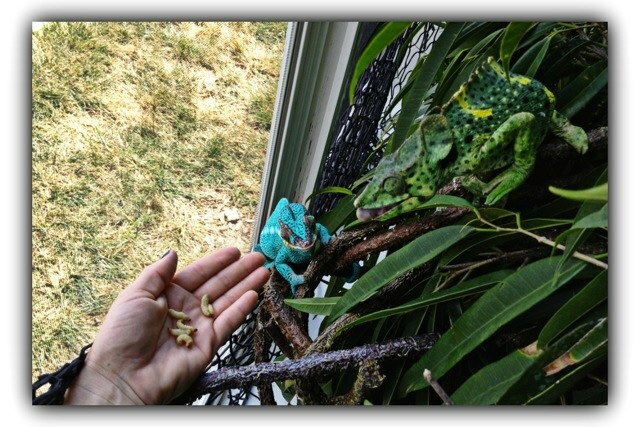 Helping chameleons with medical problems has encouraged me to take time to learn more about them and their nutrition. Chameleons have needs like any other animal: food, water and shelter cover the basics. In this article, I want to address the deeper side of nutrition and how we can use it to not only nourish, but also to heal. When a chameleon falls ill, the pattern is typically: go to the vet, spend some time and money while there, then take home some medicines to administer. All the while, if you are anything like me, you will be wracking your brain over what you could have done differently or why this happened. Despite all present information, chameleon-care is still, in part, a mystery and we will be guessing at times. Keeping a journal on weekly gutloads, bugs, weights, temperatures, medicines, et cetera, has helped me tremendously. Doing this may seem like a pain, but if something does go wrong then this information may prove to be very valuable. When the worst happens and you find yourself at the vet, try to remember these two very important questions: What are the side effects of this medication? Why did you choose this route of treatment? Knowing these things could help you in the next week or two once home, and certainly will help if the current route of treatment isn't working. So, you just spent a good portion of your day and a few hundred dollars, figuring out what is wrong with your sick chameleon. What else can you do? I am becoming very aware of what medicines are out there and what the effects they have on chameleon. And I have expanded that study to the effects certain feeder insects and gutloads can have. Sometimes, trying alternative means of treatment can help; I find a place for both traditional eastern medicine and allopathic western medicine in my rescue. For example, several of my chameleons are on antibiotics, which can be rough on their tiny kidneys. As Hornworms are 85% moisture, they help protect renal functioning by diluting bodily toxins naturally. So when the antibiotics are out, hornworms are in the feeder bowl. That was simple! Let’s take a look at a case where both feeder and gutload can be adjusted. 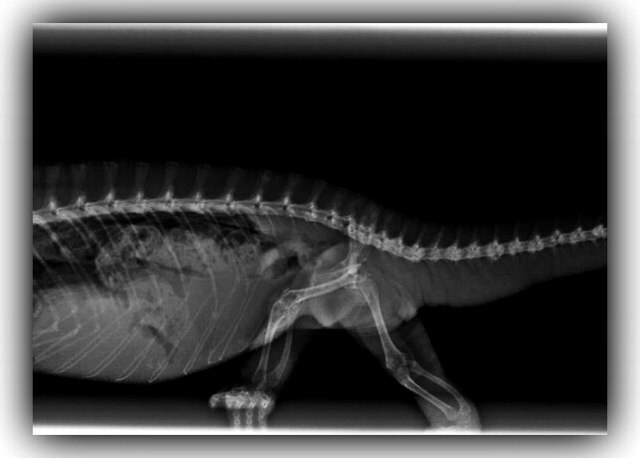 I had a male Furcifer pardalis recently pass from cirrhosis of the liver, along with severe arthritis in his spine. We knew something was wrong when he had severe neck edema. This chameleon had a hard time processing an anti-inflammatory medicine because his liver was damaged. Knowing this at the time could have changed the outcome. Applying the diet-based approach during his medication I would have shifted his diet accordingly. I have learned that Silkworms contain serrapeptase, an enzyme in their stomachs that act as a natural anti-inflammatory and pain-reliever. It even cleans teeth, too, when eaten. This insect not only is a good source of nutrition, it could even be good alternative supplement for tougher cases. Rotating gutload ingredients is a very good idea; too much of one thing isn’t good for anyone, chameleons included. I use many gutloads that have various outcomes. In the above case, an anti-inflammatory gutload fed to crickets, roaches or grubs would have been appropriate. Here is one for you to try. Antioxidant properties reduce inflammation, stimulates the liver & digestion, supports immune functioning, regulates and maintains energy levels. Contains high levels of antioxidants which reduce levels of inflammation. Neutralizes free radicals, acts as an anti-inflammatory, reduces the risk of colon cancer and cardiovascular disease, contains a good balance of magnesium and phosphorus, helping calcium absorption. Crush to sprinkle on the mix. In conclusion, we all know chicken noodle soup is the perfect thing for getting over a cold. There may or may not be healing properties in that soup, but, with a little research, you can introduce healing properties in your chameleon’s food when they are down and out. They will appreciate their healing diet! Asia Kauffman has been working with chameleons for over ten years now. She started The Chameleon Rescue and Rehabilitation Center in 2011 where she works closely with a local exotic veterinarian. In caring for sick and injured chameleons she maintains a special focus on the vital role nutrition plays in their rehabilitation and overall health. She currently lectures at the local reptile shows in the mid-west in hopes of encouraging present and future chameleon-keepers alike to properly care for and maintain these remarkable creatures.